More firearms manufacturing jobs headed to Alabama! MADE IN ALABAMA: Firearms manufacturing jobs headed to Alabama! BESSEMER, Ala. — Austrian Company Steyr Arms has started the process to begin producing the famous AUG rifle (Armee-Universal-Gewehr — “universal army rifle”) here in Alabama! The company has been based in Bessemer, Alabama for several years, and assembles the rifle from parts imported from Austria for American consumers. 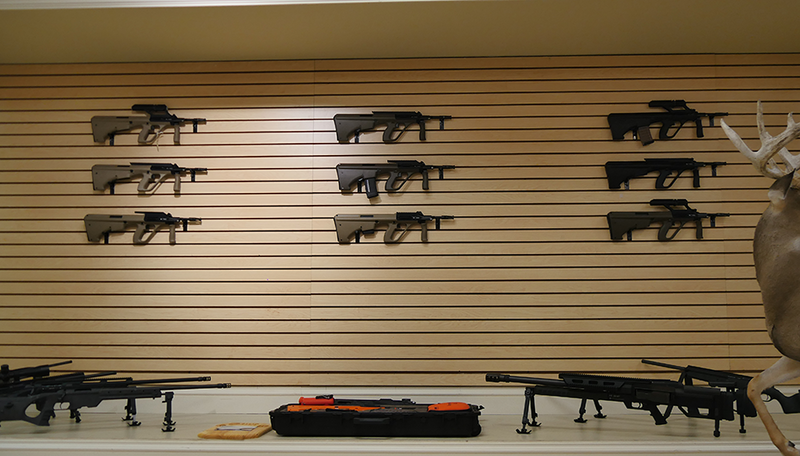 The $2.9 million expansion will allow the company to produce the rifles right here in Alabama! Federal regulations, known as 922(r) requires that foreign made military rifles must be assembled in the United States from imported parts, with a certain number of parts being produced in America. 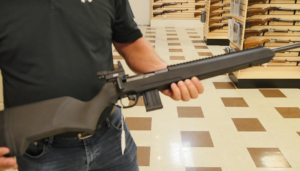 Steyr Arms’ North American operation has been assembling the rifles at their Bessemer location, but is now moving to produce the components in Alabama. 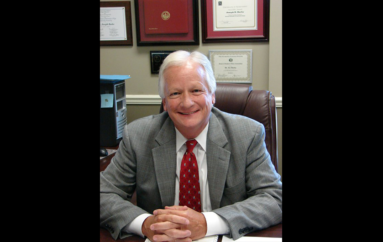 “It’s a two or three stage process before the City Council of Bessemer, The Jefferson County Commission, and the State of Alabama all have to approve the tax abatement,” said O’Brien. 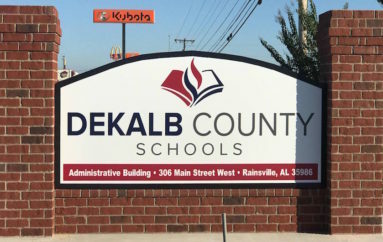 On Monday, the Jefferson County Commission approved a tax abatement for the Austrian firearms giant to expand their Bessemer operation and on Tuesday, the Bessemer City Council followed suit. As Steyr CEO Scott O’Brien explained, it’s a long process to get everything in order, but the expansion should be complete within a year. O’Brien also explained that this expansion is only the first phase to what he hopes will lead to more and more of Steyr’s firearms being produced in Alabama. “The first phase will be just with the AUG rifle, then pistols, and if we are successful there, we’ll start doing more and more,” said O’Brien. 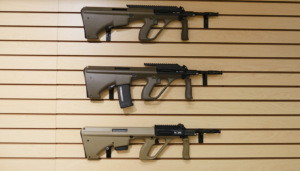 The modernized AUG comes in several variations, and is fully customizable. The latest variant, the AUG A3 M1, has the option of an integrated rail system for mounting an optic or the classic optic (featured above) in either 1.5x power or 3x. The rifle can be purchased in NATO configuration, which accepts proprietary magazines (standard AR 15 magazines) or Steyr produced magazines, which comes in a 30 round or 42 round magazine. While many may desire the M1 to easily obtain standard magazines, the 42 round Steyr magazines are reasonably priced and readily available on the company’s website. 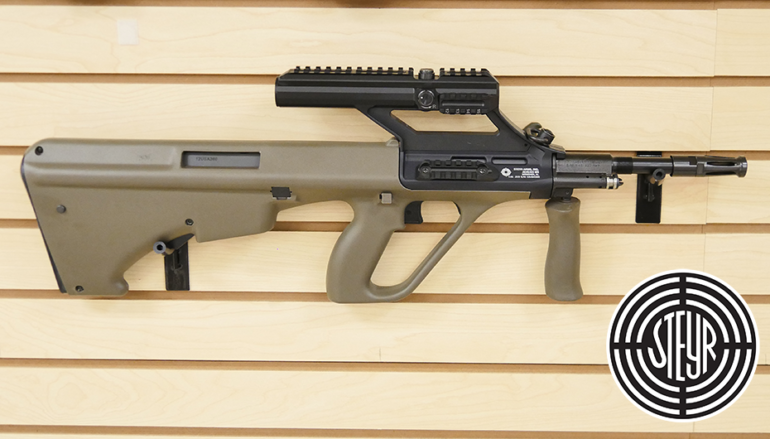 The AUG also has the option of a short, long, or extended picatinny rail system, which would allow the user to mount various optics, lights, or lasers. The rifle is also available in Green, Black, Mud, and White finishes. Steyrs’ line of handguns are striker-fired with a polymer frame. Their pistols come in a compact (C-A1), sub-compact (S-A1), mid-size (M-A1), and long slide variant (L-A1). Available calibers are 9mm and .40 S&W. A model with an OD green frame (M9-A1) is also available. Steyr’s pistols also feature innovative “triangular” sights which aid in quickly obtaining proper sight alignment. While on site, O’Brien also gave us a look at a new rifle for 2017, the Steyr Scout RFR, which is a rimfire variant of Steyr’s Scout Rifle. The rifle is available in .22lr, .22 Magnum, and .17 HMR. The RFR features a 10 round magazine and a knife that tucks away conveniently in the buttstock. While we were given an exclusive look into Steyr, the showroom is open to dealers only, but as O’Brien explained, for one weekend, the public will be allowed access to view Steyr’s many fine products, as Steyr will be hosting their annual ‘Open house’ sale. “It’ll be the third or fourth year we’ve done it, but on the weekend of July 20th, we’ll open the doors to the public for three days and allow the dealers to sell our inventory,” said O’Brien.